The Summerton Club is a high quality spirit subscription based club, but one that offers a lot of flexibility along with high end products delivered to your door each month. With a cost of £50 a month, it’s straightforward, that includes delivery and a high quality bottle of spirit from a selection of aged brandies (Armagnac, calvados, Cognac), rums (cachaça, rum, rhum, ron), whiskies (bourbon, whiskey, whisky) and more, from around the world. You can opt from just a whisky selection or have a random selection across the board of drinks. texture has a light oiliness. What makes The Summerton Club more than just the usual subscription service is that it sources really unusual and hard to get hold of bottles allowing you to try luxury brands that you wouldn’t just pick up in your local supermarket. For example the Gruguld variety from MackMyra isn’t even availalble in the UK. This looks good as either a treat for yourself or as a gift for a friend or family member, which brings me on to this time of year. With Christmas fast approaching, most of us know whisky loves among us and if you are looking for a special gift then this could be it. The Summerton Club offer a variety of options so you can opt for monthly, bi monthly or quarterly options, you can also cancel at any time so your hands aren’t tied to a lengthy subscription should you not want to. From my experience the quality is there, any recipient would be delighted with their delivery and it gives that touch of luxury combined with a unusual product to try. If you want to check it out, head over to The Summerton Club now to see your options and get your order in for the perfect festive gift!! WILF Books are a monthly subscription service which sends children a box of books (minimum of three) to enjoy, love and encourage their reading skills with. The box can be tailored to your child’s age and tastes, so if there are any themes they don’t like you can excluded them. The books can be fiction or non-fiction and are uniquely chosen for each child. The books come well presented and individually wrapped up with a cute note and sticker. This all adds to the excitement when the child opens it up and they are eager to see what books are inside. Also included is a freepost envelope where you can return any books that have been read or any from your child’s own collection that they no longer want. As long as they are in good condition they will be recycled in other boxes so that more children can get enjoyment from them. The more you do this, the more likely that extra books will be included in your future boxes. Miss M was happy with all of her books and soon got down to reading them at bedtime. They are all books she could enjoy and read at her leisure and she really enjoyed receiving the bundle of books. The idea of a subscription is a great idea for a gift for a child and something they can look forward to each month. 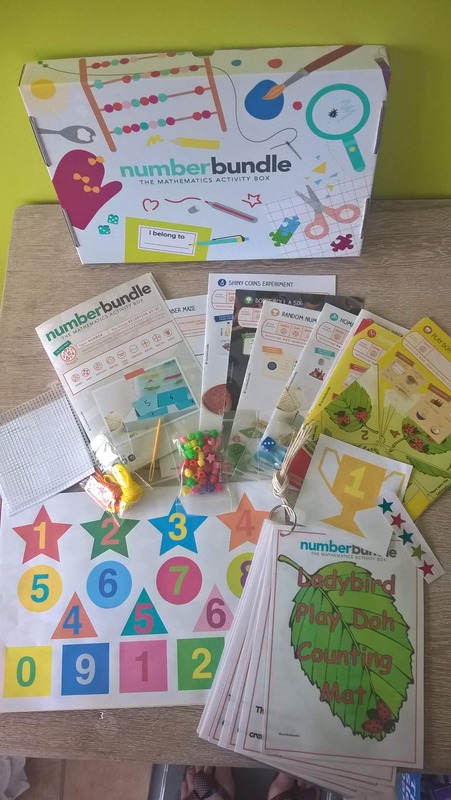 Numberbundle are a new range of activity subscription boxes aimed at ages 3-7 years and support the Early Years foundation stage and National Curriculum. The boxes are themed each month and we received the ‘Number’ themed box aimed at reception age children for 5yr old Mister B to try out. Each activity is clearly set out in it’s own individual leaflet, making it easy to follow and clear to see what extra things you may need such as colouring pencils, scissors etc. All extra’s are just basic items you would have at home anyway. Mister B was keen to start with an activity that he saw used an egg box, one of his favourite junk modeling items so he eagerly started cutting out some numbers for his ‘Random Number Shake’ and numbering inside the sections of the egg box. He then stuck the numbers into the lid of the box and a couple of spare one’s on top. We then put a button inside which he loved shaking about to see what number it landed on. There are many options for games and activities with this from getting the child to write down the number they land on, write the correct number of dots corresponding to the number or taking turns to see who can land on all the numbers first. 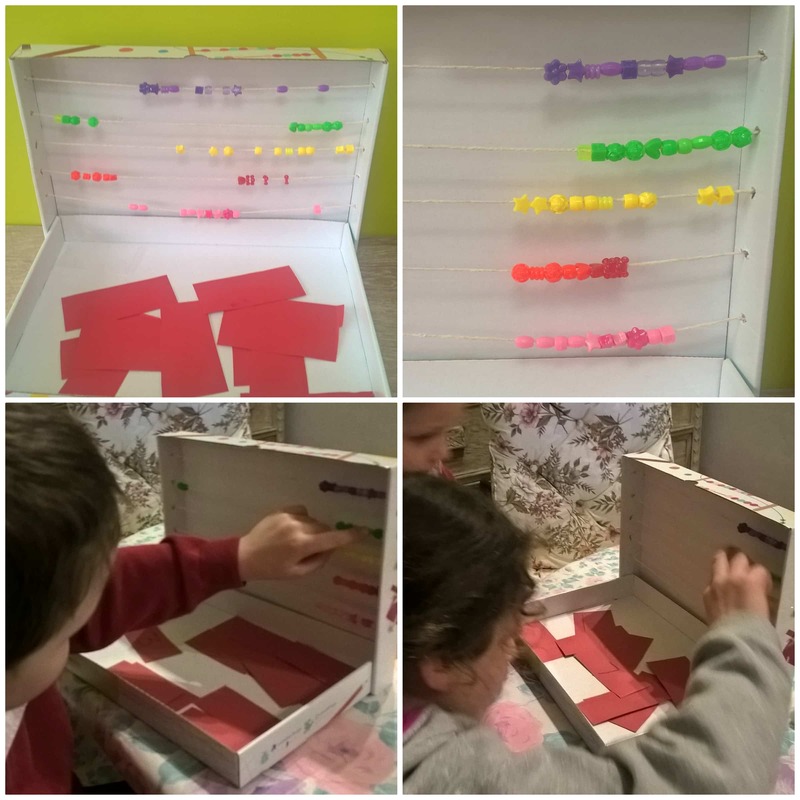 We then moved onto making an abacus using the box that all the bits came in and some included string and beads. Mister B absolutely loved sitting threading the beads on each piece of string and sat in deep concentration until he had finished and I attached the ends to each side of the box. I think this was a brilliant activity and we have spent much time over the last week playing with the finished abacus. Mister B loves working out little sums for me and has been adding and taking away from ten quite confidently! Even big sister Miss M has been joining in. We’ve also been doing some science experiments turning dirty old coins into shiny new looking ones and laying them in sequences. Another of Mister B’s favourites was homemade play doh which he used to make the correct number of spots on ladybirds. A game we had lots of giggles in is ‘Don’t roll as six’ as when you do, you have to do 10 seconds of exercise such as running on the spot or star jumps. Mister B loved this and now wants to play it all the time! As you can see we’ve had non stop activities and fun from this subscription box and there are still more activities on top of what I have mentioned. I think the value in the boxes is up to you to make the most of them with your child, but if you do there really is hours of things to do and you can play certain things again and again. I think what’s most important here is that the child is having everyday fun, but learning at the same time without really realising it. Mister B just thought it was a box of fun things to do when he got home from school each night and asked to try a different thing each day. Magazine.co.uk subscriptions – great gift ideas! Magazine.co.uk is the UK’s leading magazine subscription website and it’s easy to see why. They have a huge range of magazines available full of celebrity gossip, health, fitness, cooking, lifestyle, kids interests and much more. There really is something for everyone as I found out when browsing the website. I’ve been lucky to try out a few annual subscriptions for me and my family and you can catch up with my posts on the magazine.co.uk blog. For me I love a bit of celebrity gossip and OK! magazine is just the thing that I can pick up and down inbetween dealing with the children. I’m also a fan of Red magazine, with real life stories, fashion and beauty, something I can enjoy when I’m on my own and can relax and read. With an imminent house move I also love to read home magazines such as House Beautiful, Period Living and Ideal Home, in fact you are spoilt for choice with the selection of interior magazines. There are some fun looking magazines for children, I know Miss M would love Animals & You and Mister B would enjoy Adventure Time or Batman. Not forgetting the husband, I’m sure he’d love a subscription to something like Top Gear or Men’s Fitness. What I like about magazine.co.uk is that you can get a whole year’s subscription to a magazine for cheaper than buying the magazines individually and also they get delivered direct to your door! Why not check out the great selection today and take out a subscription – they make great gift ideas especially for birthday or Christmas, but also why not treat yourself? Toucanbox’s are themed monthly activity boxes for children delivered to your door suitable for children aged 3-8 years and come packed with all the supplies you need to make the activity ideas included. My daughter Miss M loves getting crafty and is always busy making things so I knew this would be the ideal box for her. We were sent the Artic box to try filled with polar themed activities to make and do. When the box arrived we were really impressed with it’s large triangular shape. Miss M couldn’t wait to get inside. The box is cleverly designed to keep the child engaged and excited as they open it. Inside on a shelf were two activity boxes. Underneath the shelf were more goodies and the box itself had things to do on it from a fold out road scene to colour, to finger puppet toucaneers to make. 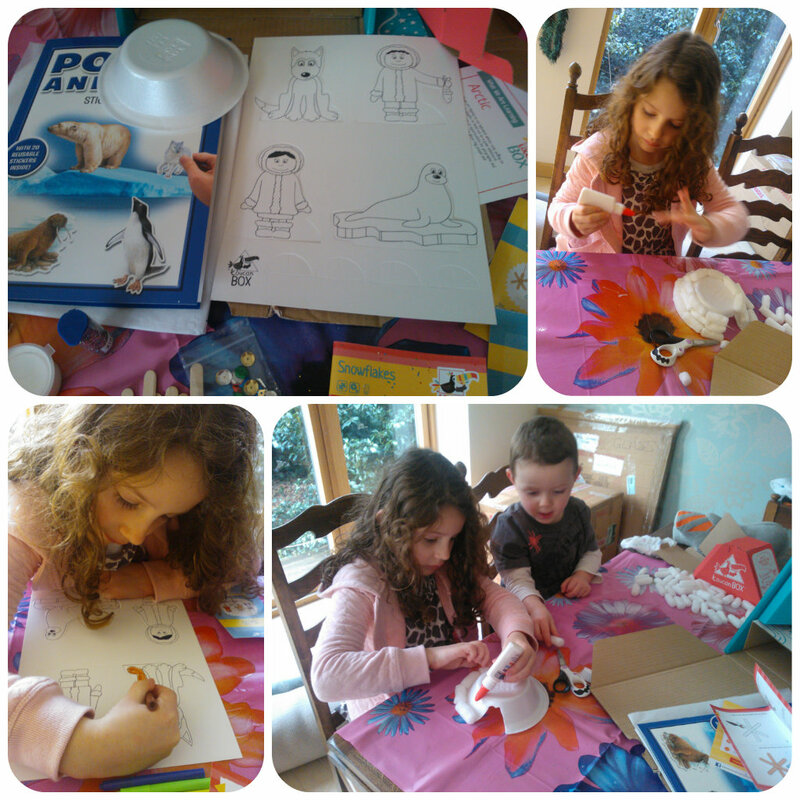 The kits included all the materials to make the activities inside such as lolly sticks, glitter glue, coloured pens, sequins etc and a really lovely polar activity sticker book, full of educational facts about polar animals and lots of stickers to add to the pages. The first activity we did was to make an igloo using an upside down bowl and sticking foam peanuts to it to resemble ice bricks. They loved this and carefully worked together to build the igloo. Miss M then coloured some figures which you could stand up beside the igloo. 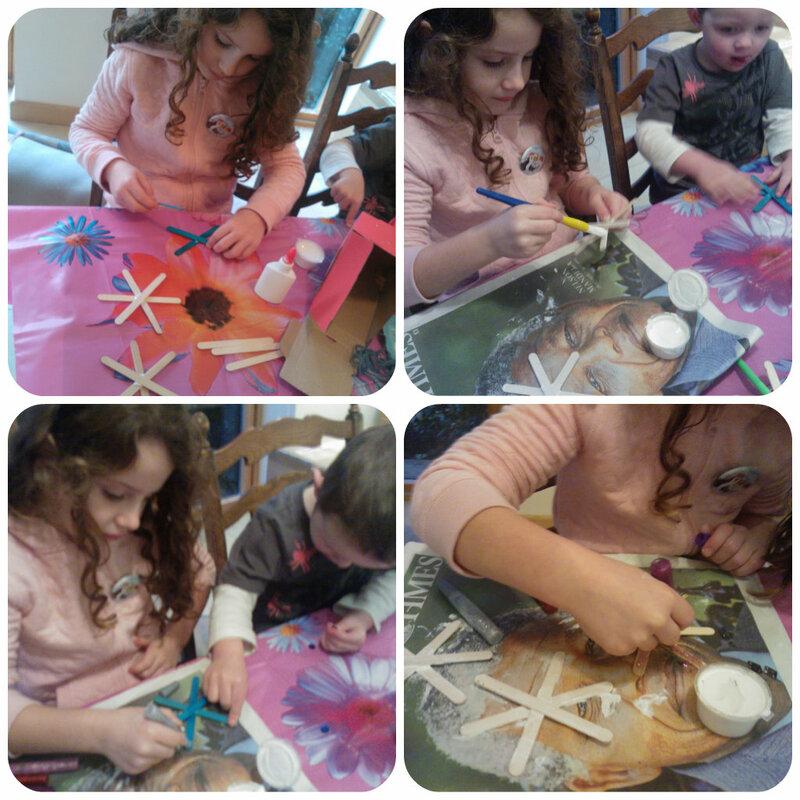 We then made some snowflakes by sticking lolly sticks together like a star then decorated them with white paint, glitter, sequins and glitter glues. Both my children loved this, Miss M hard at work concentrating on the task and Mister B observing telling Miss M what coloured sequin to use next! Also included is some wool to use to hang the decorations up. 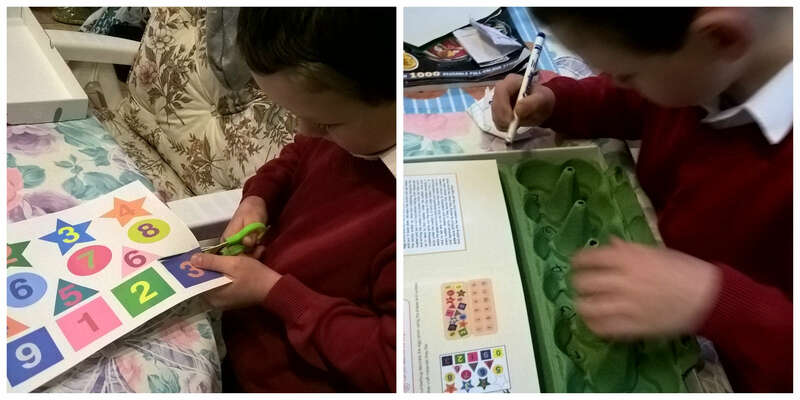 The polar activity book was sure to be a hit having stickers to put in place for some of the animals, something my two always find fun. The book was excellent quality and what I like about it was that it was educational with lots of facts to read and learn about the animals. Miss M now keeps this on her bookshelf with other animal books as it’s something to look back at and keep learning from. For me the toucanBox provided much more fun that I first thought. We sat down one afternoon to do the activities but didn’t finish leaving more to do the next day. For little ones this really will keep them occupied for a few crafty sessions and it’s lovely to see all the things they make. The Artic box is great for this time of year with it’s wintery feel to it. 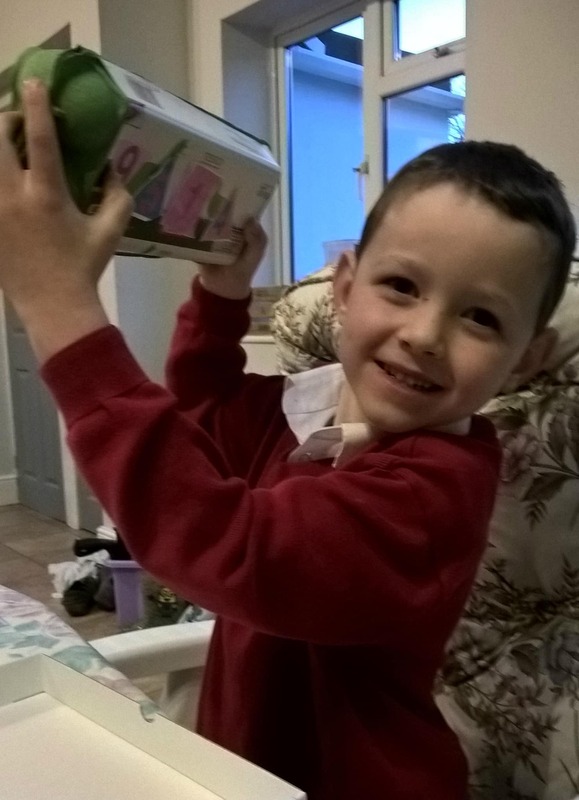 What makes the toucanBox overall a success is the lovely range of ideas, simple clear instruction cards, an exciting fun box to open and above anything else is that everything is included – all materials that you need to make the crafts. The only thing we had to use from home was a pair of scissors. The other important aspect for me is whether the children enjoyed the toucanBox and how easy it was for them to follow. 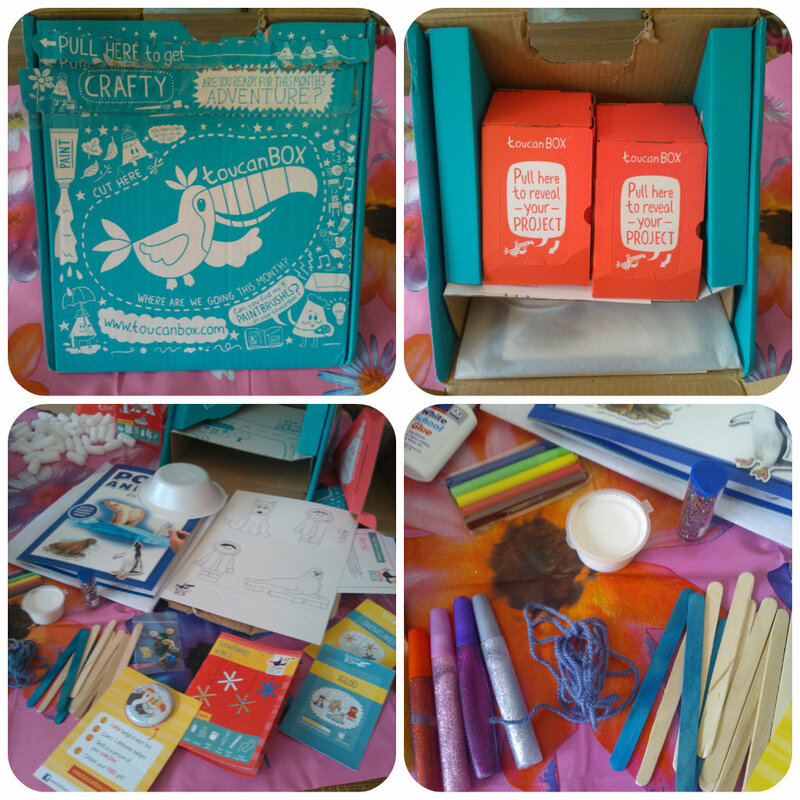 I can honestly say that Miss M loved the toucanBox and happily crafted with the contents for hours. She needed minimal guidance to follow the instructions and made all the creations herself. 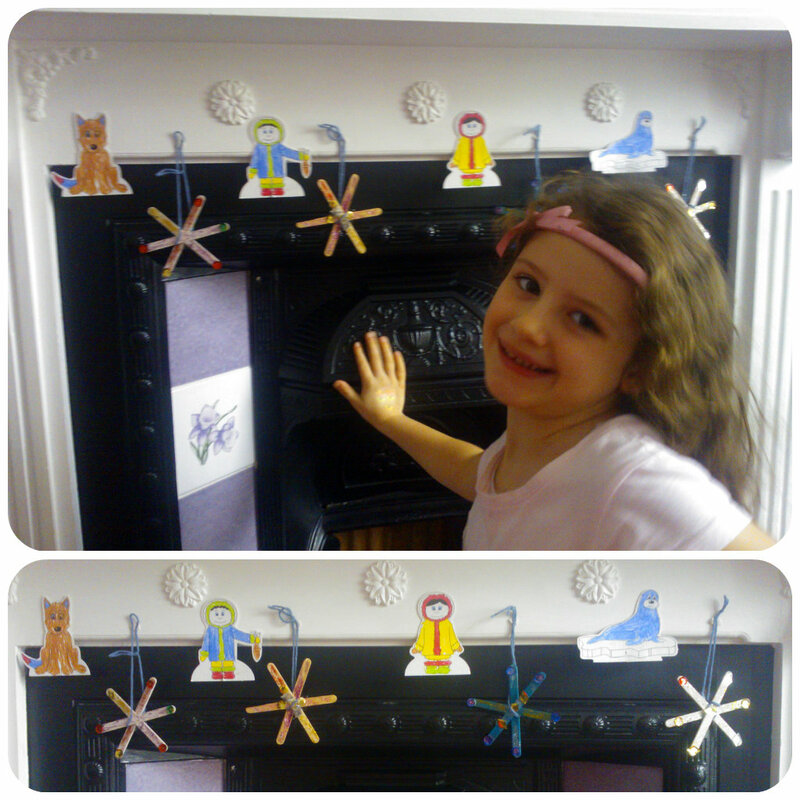 As you can see above, she is proudly standing by her finished decorations that have adorned our fireplace this Christmas. I think any young child would be happy to receive one of these boxes, subscriptions start from just £9.95 a month and there are a wide range of themed boxes available from birds, ballerinas, pirates to mad scientists – something for everyone, why not check them out? All reviews are my own and my family’s opinions. We are not paid for reviews although we do receive the product to try out and enable us to write the review.